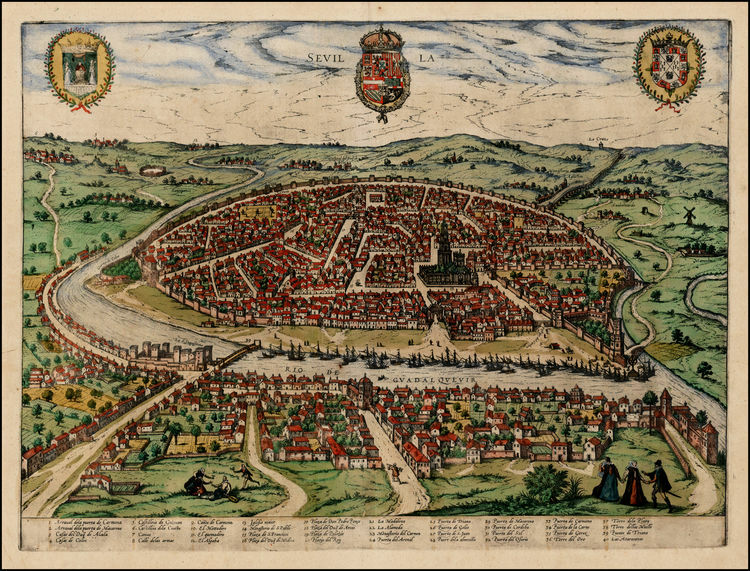 A couple of my recent updates/posts have focused on early trombone activity in “New Spain.” This post centers instead on early trombone activity in an important city in Old Spain. The post combines some new entries with several entries that were already included in the Trombone History Timeline. As you can see from the sources, Robert Stevenson and Kenneth Krietner are noteworthy experts in this field. Quite a few of the entries detail activities of the wind band at the Seville Cathedral, or Catedral de Santa María de la Sede. 1474—Seville, Spain: King Ferdinand employs a trombone (saccabuche) (Baines, Brass 108). 1526—Seville, Spain: Authorities decide to set up a permanent full-time instrumental ensemble, saying, “It would be very honorable in this holy church and in the praise of the divine worship to have on salary, for their own use, some loud minstrels [menestriles altos], trombones [sacabuches] and shawms [chirimias], to use in various of the most important feasts and the processions that the church makes…they determine and order that five loud minstrels be received into this church: three shawms (treble, tenor and contra) and two trombones [sacabuches], persons skilled in their art, to serve in this church…” This group constitutes the earliest known cathedral ensemble in Spain (Kreitner, Minstrels in Spanish Churches; original Spanish in Stevenson, La Musica 27). 1533—Seville, Spain: Church records for the Seville Cathedral link the trombone with the contralto part: “On this day the said Lords, called the previous day, submitted [the following] to the Lords Archdeacon De Niebla, Prior and Canon Zambrano, and Prebendary Diego Fernandez, so that they, along with the maestro de capilla, recognize the ability of Francisco de Flandes, chirimia tiple, and so recognizing it, award him the salary they deem appropriate, and also see if Andres de Deça can serve for the contralto, since he is a trombone player [sacabuche], and if it seems to them that he can serve well, that they receive him with the salary that seems appropriate” (Stevenson, La Musica 28-29). 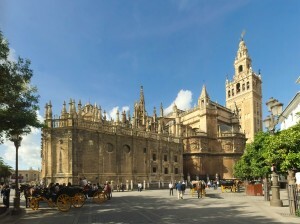 1553—Seville, Spain: The salaried Cathedral wind band established in 1526 apparently having deteriorated or disbanded, church officials decide that Cathedral instrumentalists should again be offered long-term contracts. 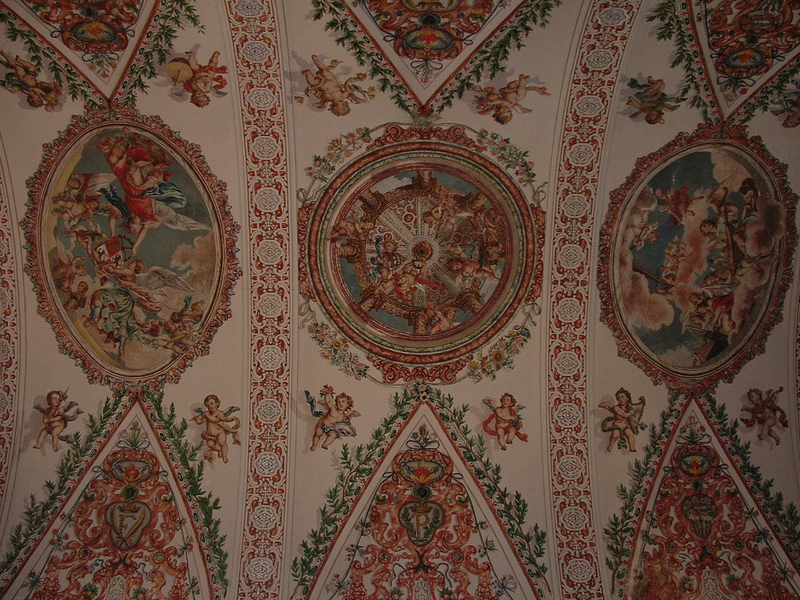 Subsequently contracts are offered to 3 trombone players: Andrés Deça, Juan Baptista, and Martín de San Pedro (Stevenson, Spanish 144; Stevenson, La Music 40). 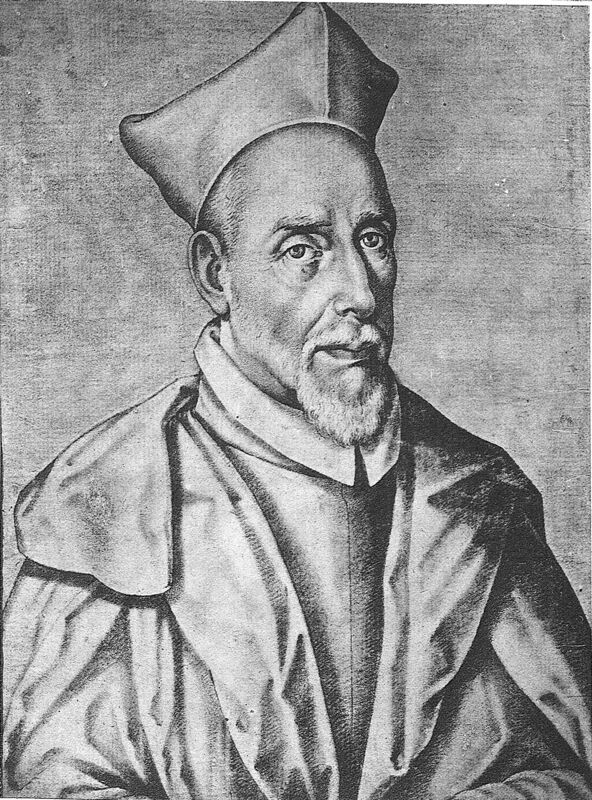 1560—Sevilla, Spain: A new trombonist, García Gonsales, is hired as a cathedral musician (Stevenson, Spanish 149). 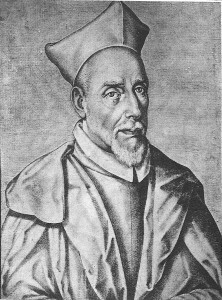 1560—Sevilla, Spain: A father and son pair—Melchor de Camargo (soprano shawmer) and Gaspar de Camargo (trombonist)—are hired to be cathedral instrumentalists (Stevenson, Spanish 149). 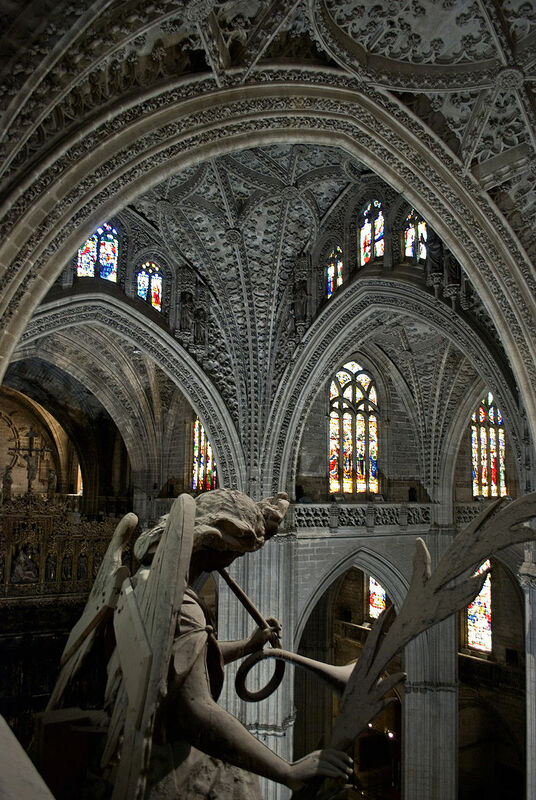 1563—Sevilla, Spain: Authorities vote to increase the salaries of 5 Cathedral instrumentalists, including trombonists Juan Baptista, Diego López, and Gaspar de Cuevas (Stevenson, Spanish 151). 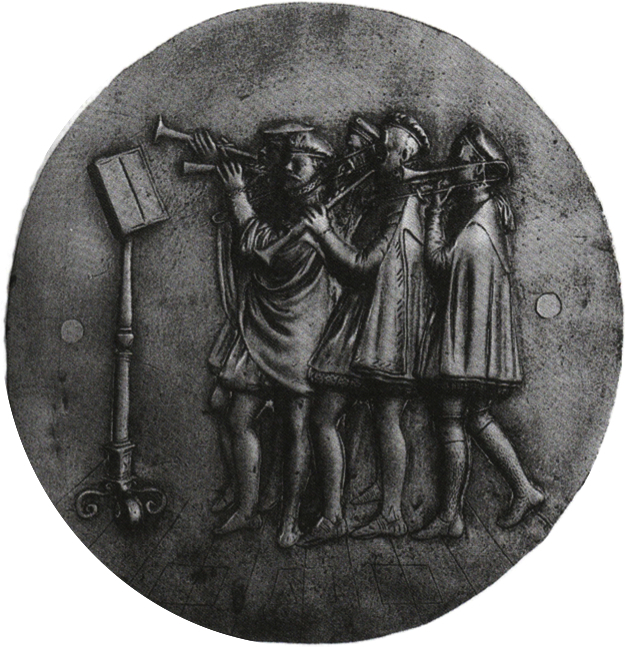 1564—Sevilla, Spain: At the Seville Cathedral, a bronze medallion by Juan Marín and Bautista Vazquez portrays 2 trombones performing with a cornett, treble shawm, and bombard. The 5 players are all gathered around a single music stand (see below image; public domain) (Kreitner, Minstrels in Spanish Churches). 1570—Seville, Spain: Seville’s Archbishop Don Gaspar de Zuñiga y Avellaneda is chosen to solemnize the nuptials of Philip II with Princess Anne, daughter of Emperor Maximilian. 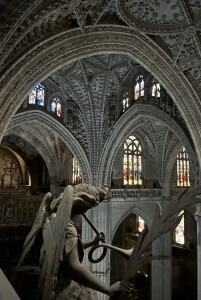 He obtains this honor by promising the most impressive retinue that the cathedral can create. At the ceremony, the king makes his entry through an archway upon which are stationed numerous instrumentalists, including 6 shawm and trombone players wearing blue robes and hats bordered with gold (Stevenson, Spanish 157). 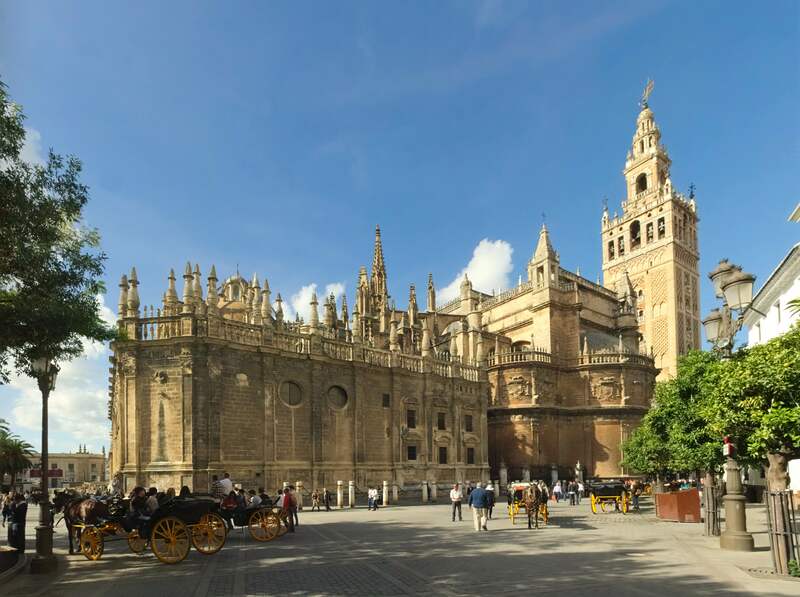 1571—Seville, Spain: 3 trombonists are among the 6 cathedral instrumentalists who have just returned from Jaén with the cadaver of the cardinal. 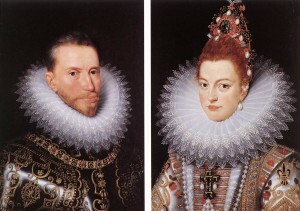 They are given special payment for their services (Stevenson, Spanish 158). The full makeup of the cathedral band is 3 shawms and 3 trombones (Kreitner, Minstrels in Spanish Churches). 1586—Seville, Spain: The cathedral band continues to include at least 2 trombones (Kreitner, Minstrels in Spanish Churches). 1586—Seville, Spain: Chapelmaster Francisco Guerrero issues the cathedral band a set of guidelines, including directions on improvisation: “First, that Rojas and Lopez should always play the treble shawms, and that they should take great care in the order of the time and place of their glossing [improvising], so that when one is glossing, the other plays the music unadorned, each being careful of the other because when they gloss together it makes such absurdities as would stop up the ears….When the same Juan de Medina plays the contralto [shawm] alone as a treble with the trombones [sacabuches], the field is open to him to make whatever decorations and glosses he wants and can play well on his instrument” (Kreitner, Minstrels in Spanish Churches). 1620—Seville, Spain: Among the leading ministriles mentioned in records of the Seville cathedral are trombone players Alonso Ortega and his son Diego, and Juan de Viedma (Stevenson, Christmas Music from Baroque Mexico 68). 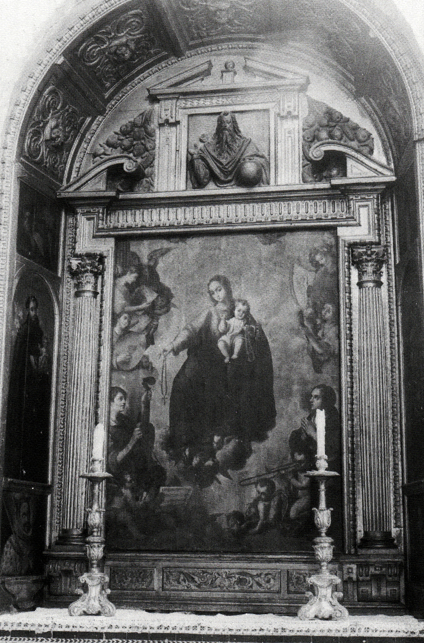 c. 1620-24—Seville, Spain: The altarpiece of the Virgin of the Rosary of the Parish of Santa Ana, probably painted by Diego López Bueno and Miguel Cano, includes a depiction of an angel playing trombone (see bottom-right of below image; public domain) (Alonso Cano 613). 1689—Seville, Spain: The church of the Hospital de los Venerables Sacerdotes, with walls and ceiling painted by Juan Valdés and his son Lucas Valdés, is completed. 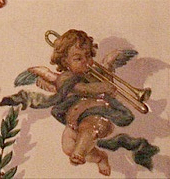 Among the numerous instrument-playing cherubs depicted on the ceiling is a cherub playing the trombone (see detail and full image below; public domain).